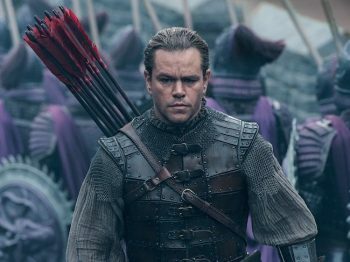 Plot: A pair of mercenaries become embroiled in a war between a secret Chinese order and a race of man-eating monsters. Format: Digital, 4K Ultra HD, 3D Blu-ray, Blu-ray, DVD & VOD. Cast: att Damon, Pedro Pascal, Tian Jing, Willem Dafoe, Andy Lau, Numan Acar. 103 minutes of eye-popping, popcorn-munching distraction. 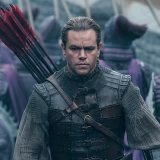 Boasting a budget of £120 million, Zhang Yimou’s (House Of Flying Daggers) English-language debut film is China’s most expensive co-production. And the result of all those accumulated zeros is impressive: an eye-popping movie, with a dazzling colour pallet, and romping action scenes that play out like a huge video game cut scene. If a troupe of lance-wielding, bungee-jumping female warriors ticks your boxes then this is the film for you. The story is pretty straight forward. Two mercenaries – William Garin and Pero Tovar (Matt Damon and Game Of Thrones’ Pedro Pascal) – are captured at the Great Wall while on the hunt for ‘black powder’. There, they discover a group known as The Nameless Order, who are tasked with protecting China from legendary monsters known as the Tao-Tie. Before they can escape, the slavering beasties attack and it’s all hands to the battlements. Jing Tian, who plays the stallwort Commander Lin Mei, is the off-the-peg honest soldier attempting to teach Damon’s rogue about honour and companionship. Pascal is the wise-cracking sidekick. While Willem Dafoe’s Ballard is the all-round bad guy. The monsters are fun, and the set scenes are breathtaking. Plot-wise, there’s not a lot else going on – beyond some tantalising monster-origin threads and a romance that fails to ignite. But at the end of the day, films like The Great Wall aren’t intended to be anything more than glossy schlock. Huge, visual spectacles that give you 103 minutes of popcorn-munching distraction. And there’s absolutely nothing wrong with that.